Usually ships in 1-3 business days. Designed for digital SLR camera lenses. 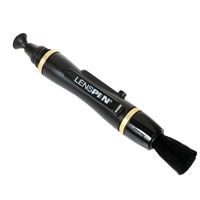 Nothing removes oily fingerprints and dust on LCD's better than a LensPen lens cleaner. Compact size, no liquids, easy to use. Unique design. Cannot dry out, and is unaffected by temperature. It is good for over 500 cleanings. Cleaning tip is flexible to match surface shape and contour of the screen. Patented clear carbon compound.